The Epping Model Railway Club promotes the modelling of NSW prototype in HO scale. Membership is by invitation to visitors who have been attending the Club’s activities. The Club holds an annual exhibition on the Queens’s Birthday long weekend. This show is typified by a strong showing of good quality generally Australian outline models. Identifiable by our bright yellow Club shirts, members can regularly be seen at most Model Railway Shows along the Eastern Seaboard and sometimes further afield. The wide variety of interests amongst our members provides a wealth of knowledge and experience for new members and modelling friends to draw from. The club and its members are very active on the building and displaying of exhibition layouts. The first club-built layout was Mt Wilson and was based on the NSWR practices in the Blue Mountains. An article on this layout appeared in issue #131 of the Australian Model Railway Magazine (AMRM). Since then many layouts have been built and shown by both the club and its members. The Epping Model Railway Club was started by a group of ten members of the Southern Cross Model Railway Association (SCMRA) in 1979. (Today the club still enjoys close ties with the SCMRA, and regularly participates in hosting meetings and forums). This small Group was active in SCMRA by assisting with the management of their Model Railway Exhibitions, held at Birkenhead Point shopping centre, Sydney in January from 1982-85. 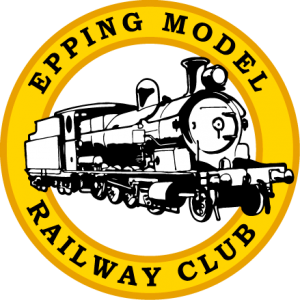 The group then registered to become an incorporated body and today is known as the Epping Model Railway Club Incorporated. From those early beginnings, the club now holds its own annual exhibition on the Queen’s Birthday Long Weekend in June. This exhibition has become a very popular show on the model train calendar, due in part to the very popular second-hand stall and the great range of Australian prototype layouts on display. The first show held by the club started at the Meadowbank TAFE college and was held there from 1986 until 1995. The show then moved to Epping Boys High School from 1996 to 2009. In 2010 another new venue, this time the exhibition was taken to The Brickpit Stadium, Thornleigh. Since 2018 the Epping Model Railway Exhibition has been held at the Rosehill Gardens Grand Pavilion. The Club and its members are very active on the building and displaying of exhibition layouts. The club activities are centred on modelling of NSW prototype in HO scale. However, members have a wide range of interests and includes other scales, gauges and prototypes. Modellers of all types are welcome at the Club.